The marathon debate over new anti-terror proposals has finally ended after more than 30 hours with the government's bill being passed. The end to the stalemate came after the Conservatives accepted Prime Minister Tony Blair's promise that MPs would be able to review the bill within a year. The PM denied it was the Tory-proposed "sunset clause in all but name". The bill, which prompted the third longest sitting of the House of Lords, later received the Royal Assent. The passing of the Prevention of Terrorism Bill comes as the last eight foreign terror suspects detained in UK jails without charge or trial were granted bail. During the long political "ping-pong", peers had refused to give up amendments that would put a 12-month time limit on the bill and place a higher standard of proof on suspects. 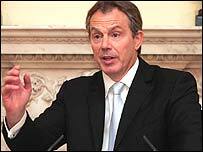 Analysis: Did Blair blink first? Instead the bill bounced between the two houses four times as the two sides failed to reach agreement. The stand-off even threatened to stretch into the weekend. Mr Blair told reporters his plan to break the deadlock was "our best attempt to get this legislation on the statute book" - and he warned the Tories there would be no more concessions on the bill. If they had genuine concerns about the legislation, "this way through meets it", he said. "If what they are actually doing is watering down the legislation in the interests of playing daft games with the nation's security then this will flush it out," he said. Asked if those opposing the bill might think they can push the government for more concessions, he said: "I think they would be making a big mistake." 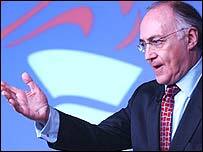 Tory leader Michael Howard said the pledge to give MPs a chance to review the law in a year's time was a "sunset clause in all but name", something denied by the prime minister. Mr Howard said: "Everyone agrees that terrorism is a real threat to our country - the point of difference has always been how we most effectively tackle it. "If only he'd been less arrogant, these sensible changes could have been agreed to in a quicker and more dignified manner." Lib Dem leader Charles Kennedy said the government had been forced to address "principled opposition" to the anti-terror bill. "People outside Parliament consider this a public victory," he said. Home Secretary Charles Clarke unveiled the new plan to a packed and rowdy Commons and described it as a "positive course of action". He said it would be produced in draft form first with MPs given time to consider its contents. A report from the independent reviewer of the control orders, contained in the Prevention of Terrorism Bill, could form part of their discussions, before a new bill was launched in the spring of 2006. Mr Clarke assured Tory MPs that all matters currently being debated could form part of the new bill. "The course of action is, I suggest, a constructive attempt to find a way forward," he said. "It will allow both houses to consider the situation in detail, and instead of allowing the legislation to disappear it will allow the legislation to be improved." Lord Falconer, the Lord Chancellor, said the debate had involved the longest ever sitting of the House of Lords - the previous was 19 hours on the Gas Bill on the 3-4 June, 1986. Did Blair blink first on terror?